PRESS STATEMENT FROM THE OFFICE OF THE PRESIDENT ELECT ON THE CURRENT SITUATION OF MEDIA FREEDOM AND PROTECTION OF HUMAN RIGHTS 3rd January 2017. The Office of the Incoming President had written to the Outgoing President to request for the opening of communication so that agreements could be reached on a transitional agenda that would ensure the release of those who are detained without trial and prevent any new arrests and detentions without due process. 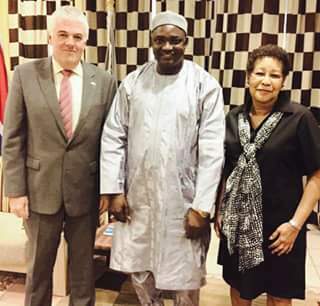 The Office of the Incoming President regrets that the climate of cooperation which commenced after Outgoing President Jammeh accepted the results of the 1st December 2016 Elections is evaporating after he changed his original position. The Office of the Incoming President wants it to be known that it does not want to inherit a country where media freedom is fettered and human rights violated with impunity. Hence, it intends to do everything it could to prevail on the institutions of the state to uphold and protect the fundamental rights of the citizens. The Media, especially, are the eyes of the government and the people in any country that values Democracy, Good Governance, Rule of Law and Human Rights. Suppression of the Media would lead to a society of uncertainty. This is why the Office of the Incoming President is concerned about the current situation. It has come to the attention of the Office of the President Elect through media reports and other sources that two Radio stations are closed down by men who claimed to be acting on behalf of the National Intelligence Agency (NIA). The liberty of two individuals are also at stake in connection with T Shirts bearing the slogan #GambiaHasDecided. Alpha Sey, a resident of Kotu Quarry, is reported to be picked up and transported in a vehicle near the traffic lights at Kairaba Avenue on the 31st of December, 2016 for wearing a T-Shirt with the slogan #GambiaHasDecided by a pickup. Wandifa Kanyi, is reported to be arrested and taken away by five men who identified themselves as agents of the National Intelligence Agency (NIA) yesterday, 2 January, 2017 around 3pm in connection with the sale of T Shirts with the slogan #GambiaHasDecided. Furthermore, Taranga FM, a community radio located at Sinchu Alaji Village in West Coast Region (WCR), is reported to have been closed down again for the third time on Sunday 1st January, 2017 by four men who claimed to be operatives of the National Intelligence Agency (NIA). Hilltop FM radio station, situated at Sukuta Lambai junction in the West Coast Region (WCR), is reported to be closed down by three men identifying themselves as personnel of the National Intelligence Agency (NIA) on Sunday, 1st January 2017. The Office of the Incoming President is fully convinced that the opening of the Media since the campaign period has contributed to a more informed citizenry and a more informed country. It is a sign of weakness for any side of the political spectrum to resort to Media closures rather than engagement to put one’s position across. In the same vein, slogans on T Shirts have nothing to do and will not upset the existing political balance in the country. Such slogans could not be stretched in any way to constitute a destabilization agenda or a crime. The Coalition is in full control of its support base and has a clear agenda that no one could derail. The Office of the Incoming President is therefore calling on the Office of the Outgoing President to improve its human rights record by releasing all those who have been detained without trial as part of the process of a smooth transfer of power. Secondly, the Director General of The NIA is being requested to review the reports of the recent arrests and ensure due process to improve the image of his institution during this transition process. Thirdly, it has come to the notice of the Office of the Incoming President that a mechanism for solving post electoral challenges has been established comprising all the leaders of political parties, the Permanent Secretary, Minister of the Interior, Chief of Defence Staff, Inspector General of Police, DG, NIA and DG, Drug Law Enforcement Agency. The Office of the Incoming President calls on the UNDP to host a meeting of the Inter-Party Committee in the face of the crisis surrounding the IEC and the Security Chiefs to discuss and address the post Electoral challenges so that tensions could be effaced and peaceful co-existence assured until a peaceful transfer of power could be effected. All should pledge their firm allegiance to be ever true to the Gambia and make our people to live in liberty and happiness and never become a bully of our own people to make them live in captivity and fear.